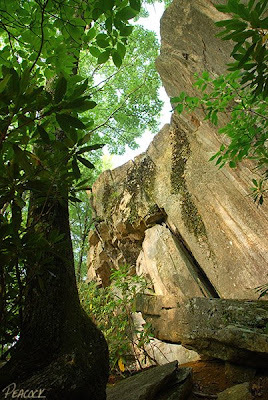 This enormous rock outcropping, known as 'High Rocks,' is found along the Appalachian Trail near Spivey Gap in Yancey County, NC. It's a two mile hike to the top with an altitude change of 1,080 feet. I love this beautiful section of the AT. The day I went the woods were so serene and quiet. 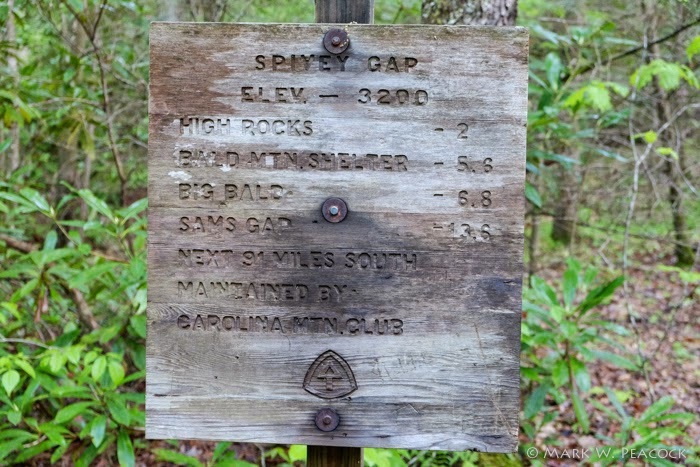 After parking at Spivey Gap you enter the forest heading south on the AT. You quickly come to a small clearing on your right that the forest service maintains as a habitat for deer and other animals. From here the trail gets steep and you climb up two sets of stone stairs before entering long switchbacks that sweep through the green covered woodland floor. The trail eventually levels out before making the steep ascent to the High Rocks. A short, well-marked, blue-blazed trail on the far end the outcropping leads to the top. The views are limited this time of year with the foliage -- but this would be a great place to visit in the late fall and winter when views of Little Bald, Temple Hill and No Business Knob can be had. I actually thought the views of the ginormous boulder from below were the most interesting ones I took. Unfortunately, in an effort to lighten my load, I left my wide angle lens in the car -- so the photos here don't begin to capture this gigantic rock perched on the ridge line. It's a strenuous hike in the August heat (be sure to take some water), even so, this is a hike that I would recommend. More photos here. 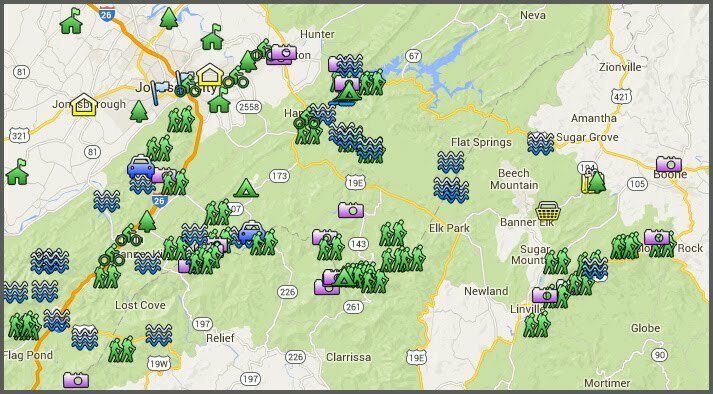 Directions: From I-26, take the Temple Hill exit (#43) south of Erwin. At the main road, turn right onto 19/23. Go 1.1 miles until the road forks. Turn to the left, taking 19W for 7.8 miles (very curvy!) to a small parking area on your right for the AT. There's only one small sign indicating the AT, so watch your odometer! The trail to High Rocks heads south (to your right). High rocks... one of my favorite hikes. Makes for a great afternoon or after-work hike. Not too long, but strenuous enough to get the heart rate up. And rewarded at the top with an awesome view. Very nice photos. Next time you leave your wide angle lens in the car just take a few multi shot overlapping photos, stitch the photos together, I recommend using Autostitch an easy to use freeware program. Ta dah, a wide angle photo with no wide angle lens. Has anyone ever hiked Spy Rock in Montebello, VA? This reminds me a little of it. I would strongly recommend it!